Print and Kindle versions can be purchased at Amazon (USA) by clicking here. It is also available in print and Kindle versions at Amazon's numerous worldwide sites. It is also available from Illusion Publishing. Harley Patrick Davidsun, the zany biker/rocker/teacher dude from The Top 10 Ways to Ruin the First Day of School, is back! 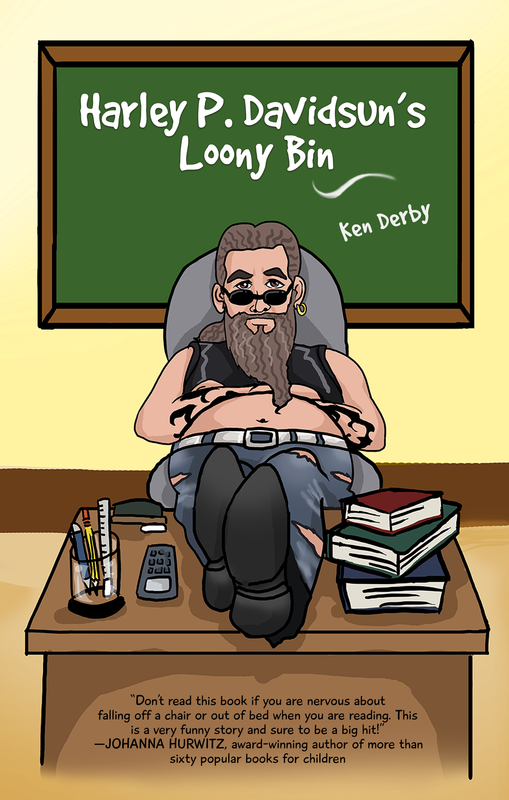 And his classroom is not what one would call “traditional.” He’s nicknamed it “The Fourth Grade Loony Bin,” and that’s exactly what it is, especially when he pits the boys against the girls in a contest to win a ride on his chopped motorcycle. Humorous events – ranging from a flatulence test to Kiss-A-Mania – mean you'll never know what's going to happen next. So step into the Loony Bin and find out who wins the wacky contest. You'll be glad you went along for the ride! WARNING! Many things in this story are totally outrageous, and adults will say that such things could never happen in real life. But what do they know? Maybe somewhere, in some distant school, there really is a teacher like Harley P. Davidsun. At least, let’s hope so.